The information about my next kombucha demo is provided below. However, due to limited capacity, RSVP is required on the Urban Homsteaders' League Meetup Page here. (You will need to join the group, but you can always leave the group after the demo). The exact location of the workshop will be e-mailed to participants the night before the event. Annabelle Ho is the author of Kombucha Fuel and has been brewing kombucha for over two years. She is currently an undergraduate student studying nutrition in Boston and is the president of Slow Food BU. Annabelle’s interests include herbalism, gardening, agriculture, and biking. These are my simple brewing instructions that I provided at my demo earlier this year for the Urban Homesteaders' League Market Stand. In addition, I've included my simple bottling instructions. More detailed brewing instructions can be found here, and more detailed bottling instructions are here. In addition, this is a link to a post where I list/link to several other kombucha recipes for more perspective and additional information. There is no recipe that's "right." Every brewer has his or her own style and favorite recipe, so adapt the recipe to what works for you! My next Kombucha Brewing Demo will be sometime in December. Stay tuned for details, and happy brewing! Note: It is recommended to clean the equipment with white distilled vinegar, because of soap’s antibacterial properties, which may harm the bacteria in the SCOBY. 2. Add the tea and allow it to steep for 15 minutes. 3. Remove the tea bags/tea leaves. 4. Add the sugar and stir until it all dissolves. 5. 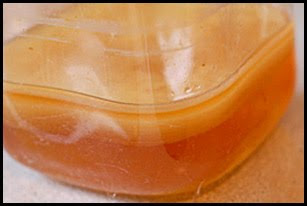 Let the sweet tea solution cool down to room temperature (hot temperatures can kill the SCOBY). 6. Pour the sweet tea solution into the brewing container. 7. Add the starter tea into the brewing container and stir it so that it’s evenly distributed throughout the solution. 8. 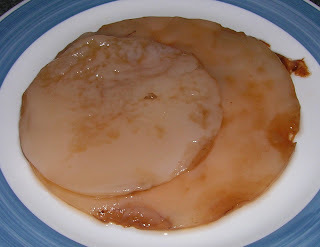 Add the SCOBY that is also at room temperature (it’s ok if it floats or sinks). 9. Cover the container with the clean cloth and secure it with a rubber band. 10. Put your brewing vessel in a quiet, undisturbed spot. a. With each brewing cycle, a new baby mushroom typically forms. 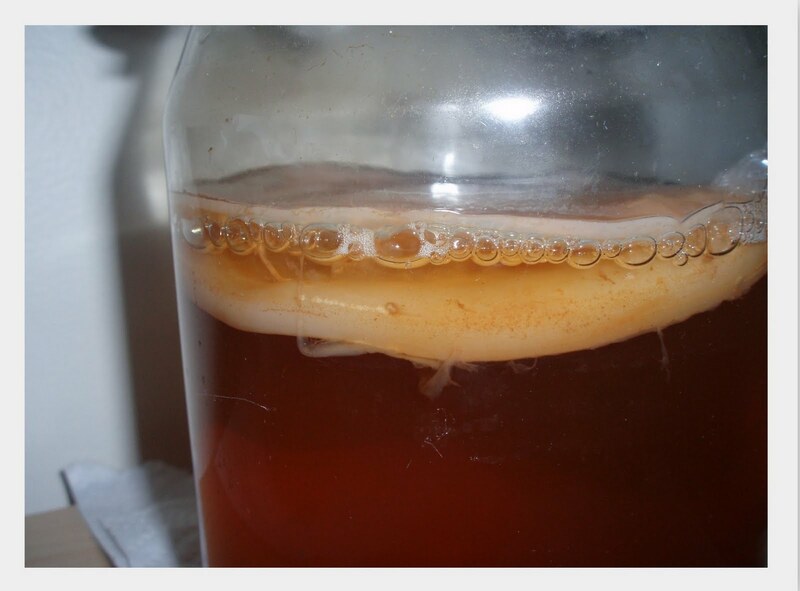 b. SCOBYs like warm temperatures and the brewing vessel shouldn’t be moved during the fermentation process, because movement will disrupt the formation of the new SCOBY. c. SCOBYs prefer warm temperatures and brewing between 75-85 F is ideal, 68-85 F is ok.
11. Leave the tea to ferment for 6-14 days (kombucha ferments more quickly in warmer temperatures, so the 6-14 days is just a guideline). 12. Your kombucha tea is done! (Signs include an apple cider vinegar aroma or taste. Taste is the best indicator; it should taste similar to a slighty fizzy version of apple cider vinegar). 13. Set aside a SCOBY and some kombucha as starter tea for your next brew. 14. Drink your kombucha tea as is and store the extra in the fridge, or consider letting your kombucha undergo a second fermentation in the bottling process. Tip: When first learning how to brew, it is recommended to brew smaller batches (1-2 quarts). Once you get the hang of it and the kombucha mother has produced new SCOBYs, you can brew larger quantities. Optional: small pieces of cut up fruit, ginger, herbs, or jams to add flavors to your kombucha. The possibilities are endless! Optional: Add some flavors to your brew by adding little pieces of cut up fruit, ginger, herbs, or jam to your bottles. Smaller pieces are better because they give the yeast more surface area to act on. I typically leave around 1.5 inches of headroom for a 12 oz beer bottle. Leave your bottle(s) out at room temperature for 1-2 days, or for week(s). The kombucha is undergoing a secondary fermentation, which can produce more fizz in the kombucha. The secondary fermentation is also a good opportunity to add different flavors to your brew. Kombucha ferments more quickly at higher temperatures. Typically when I have a batch I try one bottle after a few days, and decide whether the rest of the bottles are ready to refrigerate or require more time to ferment. *PLEASE NOTE* if you leave your bottles out for too long, they may explode due to the buildup of carbon dioxide. 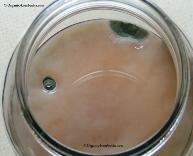 Refrigerating the kombucha will cause the yeast and bacteria to go dormant. Fermentation isn't completely stopped, but is slowed significantly. Enjoy and drink your kombucha! 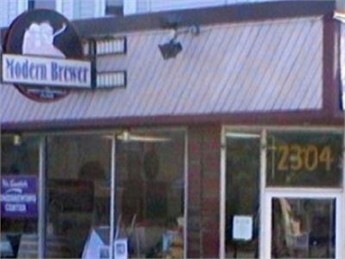 Where to shop: The Modern Homebrew Emporium is great for brewing supplies of any kind. Location: 2304 Massachusetts Ave., Cambridge, MA 02140, T: (614) 498-0400. Thanks to everyone who took a break from the gorgeous day last Saturday and joined me at the Kombucha Workshop at Taberna de Haro! In addition, thanks to everyone who came from the Urban Homesteaders League- I really appreciate the positive feedback! I would also like to thank Taberna de Haro for letting me use the space for the workshop. Read my post on Taberna de Haro on my other blog, Herbal Medicine Box. It was a good time, and to those who took home SCOBYs, have fun! I look forward to the next kombucha demo. I've been receiving numerous e-mails about where to buy kombucha mushrooms, so here's a quick rundown of your options. My availability: Unfortunately I am unable to provide kombucha SCOBYs at this time. Grow your own! 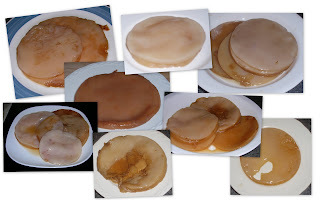 Read about my experience growing a kombucha mushroom here and this blog post on growing kombucha SCOBYs. Willing to spend the dough? Buy a kombucha mushroom online, such as from Happy Herbalist, Kombucha Kamp, or getkombucha.com. If you have any more ideas of where to obtain kombucha mushrooms, please share! My next Kombucha Workshop will be at Taberna de Haro, the Spanish wine and tapas restaurant in Brookline that I work at! Read my post about Taberna de Haro on my other blog, Herbal Medicine Box. It's not hard to brew your own kombucha at home, and it's fun! I will demonstrate and explain the basics of brewing and bottling kombucha. Topics to be covered include required materials, the traditional and continuous brewing methods, how to grow your own kombucha mushroom, and more.Samples of home-brewed kombucha tea will be available to taste. SCOBYs will also be available for individuals to take home. For those interested in adopting a kombucha mushroom, bringing a clean, glass pint jar would help to facilitate distribution. Thanks to everyone who braved the heat and came by for the kombucha demo at the Urban Homesteaders' League Market Stand in July! Despite the heat, it was a blast! Check out some photos from the market stand that day (you can't see me or the kombucha, but you can see the crowd!) Also, see the broadside that covers the information covered in the July skillshares at the UHL Market Stand, which include city composting, my simple recipe for brewing kombucha, making jam, and herbal salves. (Please note that in the kombucha recipe, it should read 1/4 cup (50 g) sugar per quart water and 1/2 cup (4 fl. oz) starter tea per quart water). Thanks again to everyone who came, and keep on reading the Urban Homsteaders' League's blog for upcoming skillshares at the UHL Market Stand! The next one is tomorrow, and the schedule is here. Thanks for reading my blog and for the continual support, comments, and messages. It's a blast, and the blog would not be the same without you! I hope you keep reading, and happy brewing! Q: Why does my kombucha smell like sulfur and/or rotten eggs? Is it safe to drink? The sulfur smell goes away in beer over time according to this thread and FAQ 5.43. Is the kombucha safe to drink? According to the threads here and here, it appears that the kombucha is still safe to drink even if it smells like sulfur/rotten eggs. However, if you don't feel good after you drink it, stop! If you think the sulfur smells are due to your water source, consider using a water filter or upgrading your current water filter. Let your kombucha age for longer periods of time before you drink it to see if the sulfur smells decrease over time. 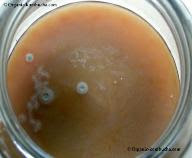 If you think the sulfur smells are due to certain yeasts in your kombucha, try favoring the bacteria in your brew. Try cleaning all of your equipment and make sure you practice proper sanitation techniques. Try starting over with a new SCOBY. If you have had any experiences with your kombucha smelling like sulfur and/or rotten eggs, have any other suggested solutions, or have any success stories, feel free to share! Join Kombucha Fuel at the UHL Market Stand at the Union Square Farmers Market on July 17th! When: Saturday, July 17th. Kombucha Fuel at the market stand from 9 am - 1 pm. Kombucha Skillshare at 10:45 am (20-25 minute demo). Description:I will be at the UHL Market Stand from 9 am - 1 pm, to talk to visitors and answer questions about brewing, bottling, and anything kombucha! At 10:45 am, I will lead a Kombucha Skillshare, covering the basics of brewing and bottling the fermented tea kombucha in a 20-25 minute demo. This demo will be in conjunction with the UHL Market Stand of the Urban Homesteaders' League. They are an awesome group! Read about the Urban Homesteaders' League and check out their blog. There will also be three other urban homesteading skillshares at the UHL Market Stand on July 17th, see the schedule here. Whole Foods has removed all raw kombucha products from all of their stores. Although it is well known that kombucha contains trace amounts of alcohol, the products were removed due to concerns with slightly elevated alcohol levels because products containing more than .5% alcohol must be labeled with a warning. Although kombucha can reach alcohol levels of 2-something %, producing kombucha with less than .5% alcohol is possible. For example, Katalyst Kombucha produces a raw, unpasteurized product with < .5% alcohol content. (Unfortunately, their products have been removed from Whole Foods' shelves for the time being as well). Here is a short discussion thread, Why does my kombucha have high alcohol content?! Luckily, this recent action does not affect those who home-brew kombucha. And for those of you who don't brew your own, now is the perfect opportunity to start! There are still plenty of places to purchase kombucha around Boston, MA. Check out my Google map on where to purchase kombucha around the Boston area. It will be interesting to see what happens, and hopefully things will turn out alright. Stay tuned for updates! Q: How do you know when your kombucha is ready to drink, ready to bottle, or if it's done fermenting? 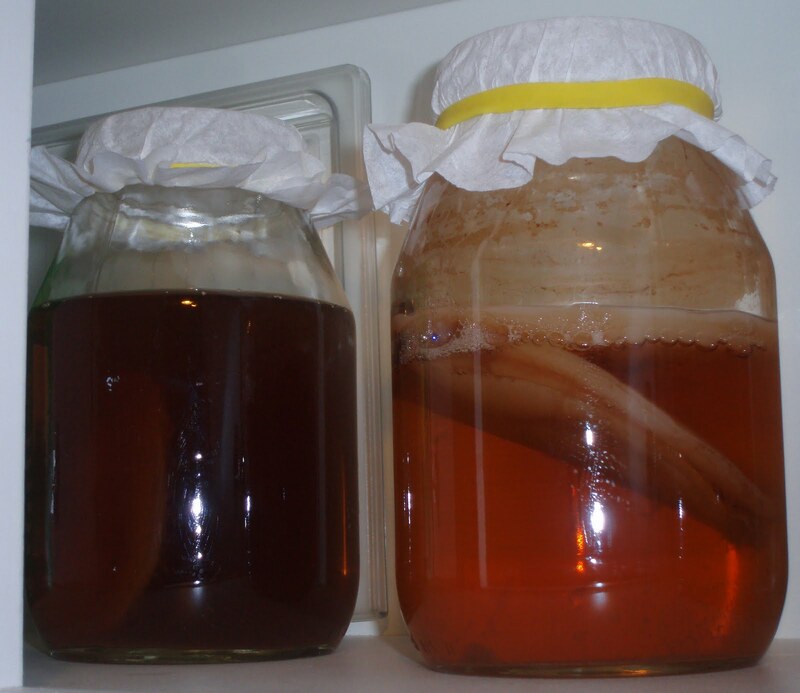 Note the clearness of the kombucha at the beginning of fermentation (left) and the cloudiness of the kombucha at the end of the primary fermentation process (right). (My apologies if it is hard to tell in this photo). Home-brewed kombucha tastes a lot different than GT's traditional kombucha. I've found that Katalyst and High Country kombucha taste more similar to home-brews. Yes, kombucha can be fizzy. I've been receiving numerous questions about fizz, so here is what I understand thus far on the matter! To begin, fizz does not indicate the health of your SCOBY or your ferment. Fizz is more a matter of personal preference, and may indicate the balance of yeasts and bacteria in your brew (1, 2). The yeasts convert sugar to alcohol + carbon dioxide. The bacteria convert the alcohol to organic acids, such as acetic acid, and water. The CO2 (a gas) that forms reacts with the water in the tea to produce carbonic acid (think of carbonic acid as dissolved CO2). Carbonic acid is a weak acid that readily decomposes back into water and carbon dioxide. When the carbon dioxide bubbles out of the water, you get fizz (4). As the new kombucha mushroom forms at the surface during fermentation, the ability for the carbon dioxide to escape decreases, helping to create some of kombucha's natural fizz. The more quickly and the more thick your mushroom forms, the less the CO2 will be able to escape, which can increase the carbonation of your drink (3, p. 33, and 5). Using more of the kombucha at the bottom of your brew, which tends to be more cloudy/yeasty, for your starter tea. Fizz can be significantly increased by bottling. My posts related to bottling can be found here. Consider experimenting with leaving and not leaving airspace. Read my post Bottling and Headroom. Adding flavors (such as jams, citrus peels, ginger, etc.) during the bottling process can also help to create more fizz. (Similar to adding a primer in beer making). 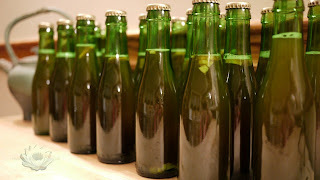 Beer bottles, which have a very tight seal, are ideal for creating fizz in kombucha. In my experience, when I've used resealable bottles (such as GT's or Katalyst kombucha bottles), I've lost more fizz. -The longer you leave your bottles out for a secondary fermentation, the more carbonation will build up. HOWEVER, if you leave your bottles out for too long, you run the risk of them exploding! Some people recommend 1-2 days for a secondary fermentation, others 3-4 days, and some recommend even longer. It all depends on various factors, including the sugar content of your kombucha and the temperature (higher temperatures = faster fermentation). -My advice: If you're fermenting a batch, try a bottle after 1 or 2 days (more or less days depending on previous experiences, etc.). Then decide whether your other bottles are ready to refrigerate, or if they could use some more time fermenting. Although there is limited information on kombucha and fizz, there is extensive information about carbonation and beer making on the web. Although beer and kombucha are clearly different drinks, they are similar in that they are both fermented beverages. Perhaps looking up beer carbonation will provide more clues as to factors that affect kombucha fizz? Try here and here for starters. What to do when you are done brewing your kombucha? One thing you can do is bottle your brew. Bottling, or a secondary fermentation, allows the yeast to feed on more of the sugar in your kombucha tea. This creates CO2, decreases the amount of sugar in your kombucha, and also makes your drink more carbonated and fizzy, which many people enjoy. 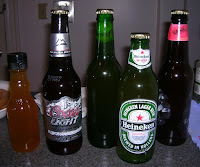 Glass bottles with narrow necks are the most common way to store fermented beverages. -The plastic material allows for expansion (decreasing the chance of your bottle exploding). -The plastic bottles become hard after a couple of days, signaling that the yeast have consumed most of the sugars in the kombucha and that you are ready to refrigerate it. -Plastics aren't good for the environment. -Some people choose to do an initial secondary ferementation in plastic bottles and then transfer the kombucha into glass bottles for long-term storage. More information on this in the Two Stage Bottling Technique at Kombucha Balance. -I don't use plastic bottles for my kombucha, but if you do, please re-use a plastic bottle only once! -If you are using raisins or dried fruit to flavor your kombucha, cut them up first! Fill your bottle(s).-It is up to you on whether or not you would like to leave headroom. For more info, read my post Bottling and Headroom. Leave your bottle(s) out at room temperature for 1-2 days, 4-5 days, or longer.-Personally, I've been doing 4 days, but the time will vary depending on the brew/brewing conditions (ex. the temperature of the room). -*PLEASE* do not leave your bottles out for too long. Otherwise, too much CO2 may build up in your bottle, causing it to explode! Refrigerate your kombucha!-If you bottled your kombucha in plastic bottles, the bottles should feel hard when it's ready to refrigerate them. -Refrigerating your kombucha will cause the yeast and bacteria to go dormant. Fermentation isn't completely stopped, but is slowed significantly. Note: Like soda, once opened, kombucha goes flat. -If you drink beer, this is a great way to use up old bottles! -They are easy to get for free. You can even get used ones for free (or cheaply) from restaurants, bars, etc. -If you feel uncomfortable using old ones, you can buy new beer bottles at your local brewing store, although this is the more expensive route. - Note- clean them well first!!! Go to your local homebrewing store and get a brush to scrub them out a bit. Then boil them, put them in the dishwasher, use Iodophor, or do whatever it is that will ensure removal of any hiding bacteria/places where bacteria can grow!-To cap your bottles, buying bottle caps are relatively cheap. I got a half pound of caps for only around $3-4 at the Modern Homebrew Emporium in Cambridge. And at only $14, the Red Baron Beer Bottle Capper is a good investment. Find it at your local brewing store or online. -The one downside- I have to admit that going through bottle caps is not the best for the environment. If this is a concern for you, the EZ Cap (Flip-Top) beer bottles, which are refillable, may be the way to go.